The Barcelona Pavilion, originally named as the German Pavilion, was designed by Ludwig Mies van der Rohe as the face of Germany for the 1929 Barcelona International Exhibition. The pavilion was designed to represent the German section and would host King Alphonso XIII of Spain along with the German authorities. In Mies’ eyes, the pavilion was nothing more than a building, it wouldn’t host art or any sculptures inside it. The pavilion would be a place to escape from the exposition transforming the pavilion into a sculpture itself. After the International Exhibition has closed, the pavilion was brought down in 1930. 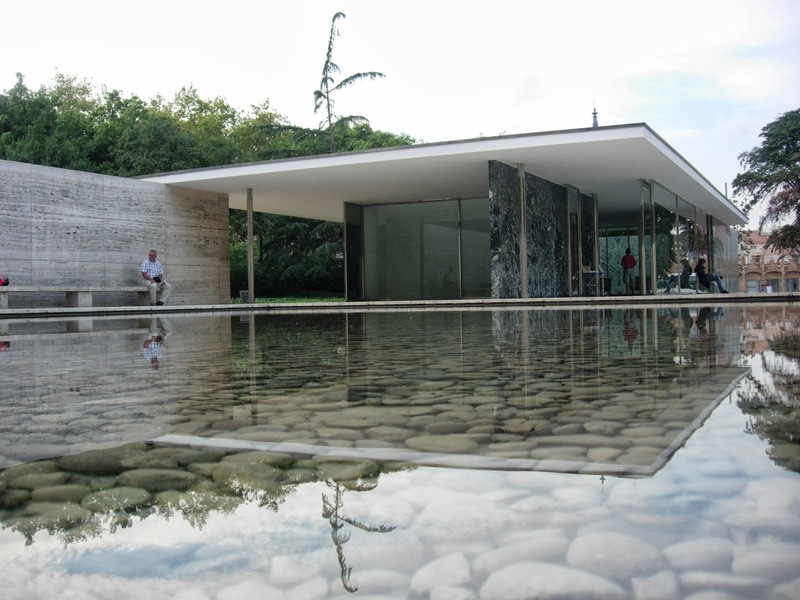 The Barcelona Pavilion has set a milestone not only for Mies’ career but also for the 20th century architecture. Because of the significance of the Pavilion they decided to reconstruct the building. The pavilion was reconstructed in 1980 by Oriol Bohigas, the head of the Urban Planning Department at the Barcelona City Council. Architects Ignasi de Solá-Morales, Cristian Cirici and Fernando Ramos researched, designed and supervised the reconstruction of the pavilion. In 1986 the pavilion was finished and open in the same site as it was originally constructed. For the reconstruction of the pavilion there was used the exactly same materials that were originally used for the pavilion in 1929. 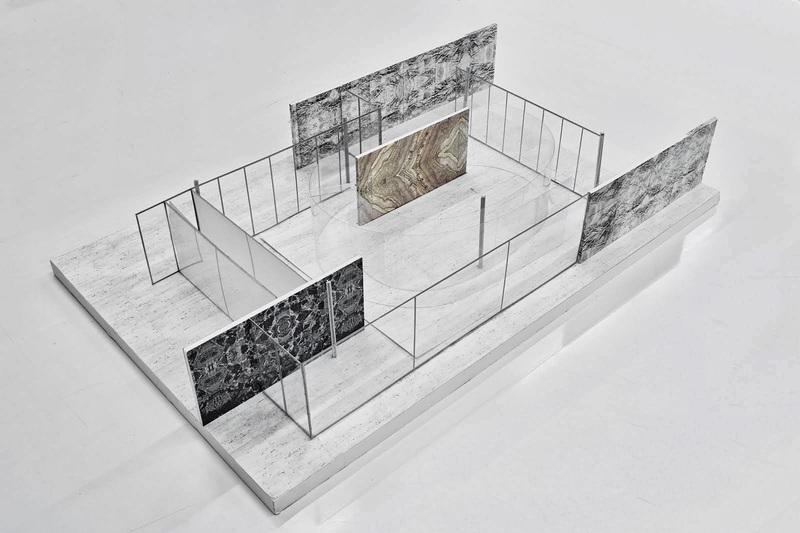 The pavilion’s design is based on a formulaic grid system developed by Mies that serves both as the patterning of the travertine pavers and also as an underlying framework that the wall systems work. The Barcelona Pavilion has a low horizontal orientation, which is established from the low flat roof that appears to cover both the interior as well as the exterior of the pavilion. The low height of the building can be said that forces the visitors to focus their vision to adjust to the views framed by Mies. The walls that are offset inside of the pavilion encourages the movement of the visitors enabling them to walk through the pavilion at take them from the small openings to open spaces. There are two pools in garden of the pavilion, one small and one bigger pool. Both of the pools are establishing the reflection of the light throughout the pavilion. The small pool is located in the rare side of the interior space, which helps the light to reflect inside the pavilion and illuminate on the marble. The larger pool stretches across the rest of the plinth, which compliments the volume. The materials used for the pavilion are glass, chrome, steel and four different kind of marble: Roman travertine, green Alpine marble, ancient green marble from Greece and golden onyx from the Atlas Mountains. A 3D model of the internal space of the Barcelona Pavilion showing the materials used for the pavilion including the marbles. Copyright © Archi-Tech. All rights reserved.